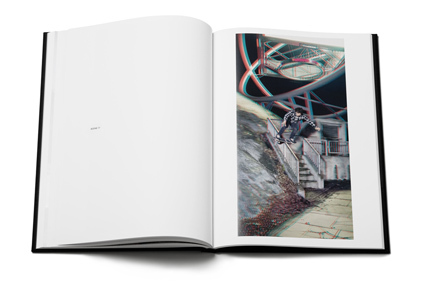 For the first time the book SKATEBOARDING.3D shows the entire series of photographs that Sebastian Denz took with members of the carhartt skateboard team. Let the 3D glasses take you on a visual journey to another world, where you will meet about 20 characters from the carhartt team: Join Giorgio Zattoni, Julian Dykmans, Gabriel Engelke, Julian Furones, David Couliau, Joseph Biais, Scott Bourne, Jan Kliewer, Hugo Liard, Christoph Merkt, Benjamin Thé, Patrick Munz, David Martelleur, Ferit Batir, Jerome Campbell, Stephen Roe, Olly Todd, Matt Grabowski, Pontus Alv and Daniel Hakansson and explore unique spots – from a sewer system transition over a forest downhill to self-made concrete spots and other special places. 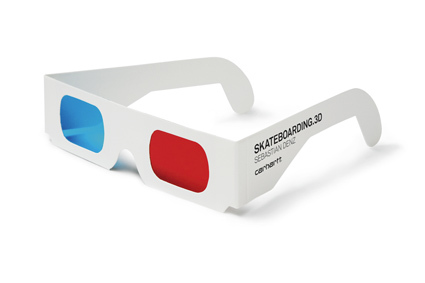 SKATEBOARDING.3D brings you a totally innovative view on skateboarding, the images will captivate you by their magic of fascinating image detail and full dedication to the moment. 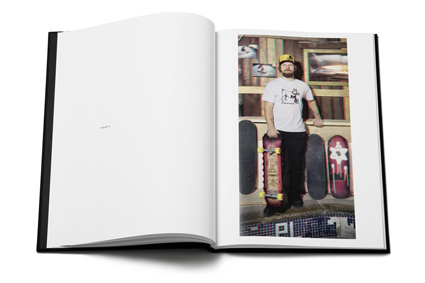 The deluxe 120 page book features a real linen hardcover with embossed title, 200 gram paper, comes in a nice 3mm thick slipcase with a linen finish on top and bottom and will certainly cast a spell on you, no matter if you skateboard or not. For his project SKATEBOARDING.3D, Sebastian Denz developed a unique 8 × 10 inch large-format-stereo-camera, that his friend and custom camera specialist Dr. Kurt Gilde built for him. SKATEBOARDING.3D deals with the constantly growing presence and evolution of virtual spaces in our society and the influence of this development on our perception of reality: “SKATEBOARDING.3D is about space in a phenomenological sense and about human beings creating their own construction of reality within these spaces. With the example of skateboarding-culture I bring up for discussion a ´hybrid space´ that is somewhere in between virtual and ´real´ – a ´postvirtual space´ (…) I’m talking about an expanded understanding of space, about lived, vibrant spaces that are loaded with many different qualities. With his work SKATEBOARDING.3D Sebastian won the 20th International BFF Promotion Award of the German Association of Freelance Photographers. A selection of images from SKATEBOARDING.3D were already exhibited, for instance during the Photokina in Cologne or at the Scope Art Fair in New York City. The actual prints for the exhibitions have an impressive „life-size“ of 2,50 m x 1,25 m. There are numerous exhibitions to follow. SEBASTIAN DENZ'S SKATEBOARDING.3D EXHIBITION IN BERLIN 24.10. - 22.11.2009!